Want to make a difference in the lives of animals in need while still reaching your own personal athletic goals? 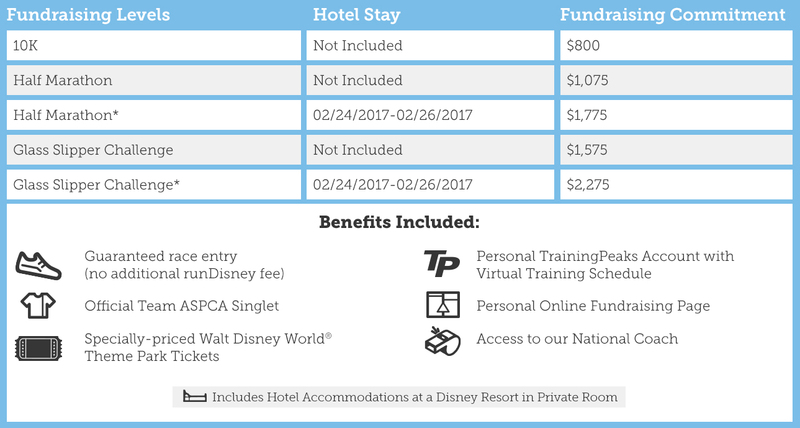 Join Team ASPCA® in February for the 2017 Disney Princess Half Marathon Weekend at the Walt Disney World® Resort in Orlando, FL, on Saturday, February 25, 2017 and Sunday, February 26, 2017. Here's your chance to join the Disney Princesses in a 'dream come true' weekend of majestic runs. You can join us for the Disney Enchanted 10K on Saturday, February 25 or the Disney Princess Half Marathon on Sunday, February 26th. Take the ultimate challenge and put your endurance to the test by competing in the Glass Slipper Challenge! A 19.3-mile adventure held over two days, participants will run the Disney Enchanted 10K on Saturday, followed by the Disney Princess Half Marathon on Sunday. Finish both races and you will be awarded the Glass Slipper Challenge medal in addition to your Half Marathon and 10K finisher medals. When you join Team ASPCA, you will be among fellow animals lovers, train virtually with our professional coaches and work to reach your athletic goals all while helping animals. With your commitment to run in the 2017 Disney Princess Half Marathon Weekend, you’ll be directly impacting the lives of the animals we serve. To be part of Team ASPCA for the 2017 Disney Princess Half Marathon Weekend and receive all the above benefits, each team member must commit to raise a minimum of $800 for the 10K, $1,075 ($1,775 for hotel level) for the Half Marathon or $1,575 ($2,275 for hotel level) for the Glass Slipper Challenge by February 13, 2017. Space is limited, so act fast! Once all of our slots are filled, we will not have the opportunity to acquire more.